9 ADJUSTABLE POWER: This neo skin removal has 9 outputs options for different treatments, you can select more accurately the frequency that is suitable for your skin, less pain for Körper levels.Level with fine needles better for stains and slugs Higher levels with coarse mole needle, skin labels and tattoo. You want to remove the moles at home instead of going from the dermatologist. Safety Tag Skin Remover Pen: This Mole Remover Pen carries carbon ionization technology, with this technology, the Mole / Dark Spot / Warts/ Slows/ Tattoos on your skin can without blood shedding effectively and quickly removed werden.Sie living a process with little pain to enjoy your flawless appearance and say goodbye to stains. 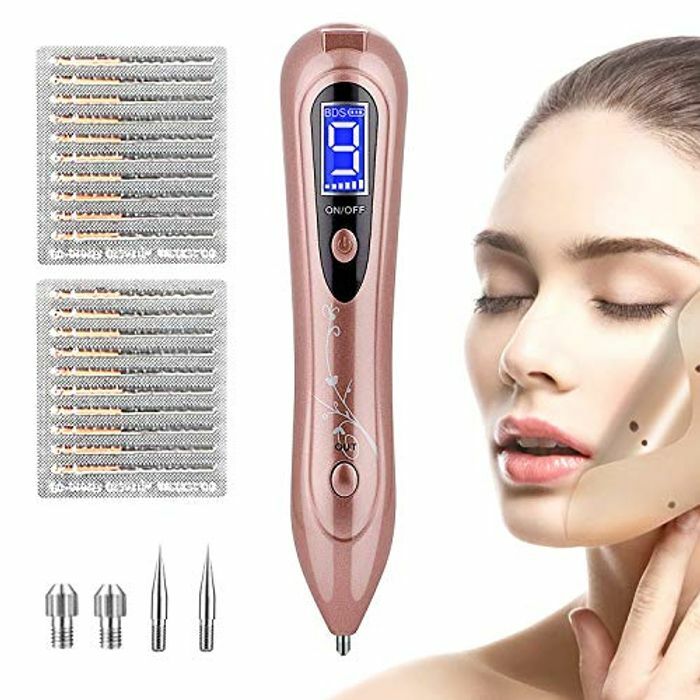 FASHION STYLE & LCD DISPLAY: Our Exquisite Facial Mole Remover Pen comes with 20 interchangeable thin needles and 2 thick, sturdy and durable needles. And this mole removal tool, designed with an LCD display, displays the working status, battery status and strength. The unique design looks like high quality, gift boxes could be a perfect gift for your friends and family. Portable Mole Remover with Rechargeable Leather Tag: Pen Grip Remover is equipped with ergonomic grip with perfect balance and weight, a button on/off design. Simply insert the needle, select the strength, press the OUT button and tap the skin target area to work through the defect. Mol Remover Pen comes with a USB cable and takes about 5 hours for a full charge. Easy to use: just insert the needle and tighten clockwise. Choose resistance levels, press the OUT button and burn exposed bumps / grinds / slugs / spots / warts, the pigmented skin underneath, forming a small scar. Let it stay, the crusts naturally fall and fall after about a week, such as slowing down / no moles ever exist.